MoreSteam has partnered with the Fisher College of Business at The Ohio State University to present an innovative Master Black Belt development program. WHAT: Our Lean Six Sigma Master Black Belt development program integrates classroom instruction on the campus of The Ohio State University in Columbus, Ohio with online learning on advanced topics provided by MoreSteam. 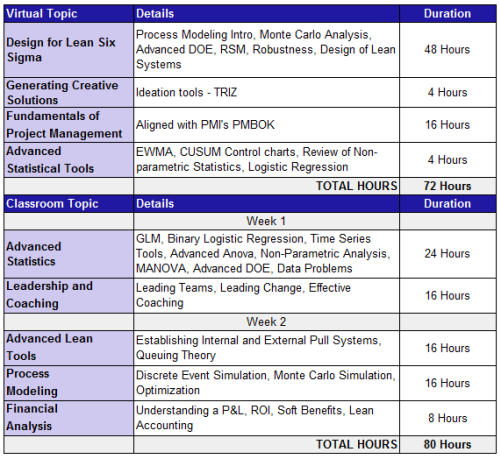 The curriculum covers: Design for Lean Six Sigma, Fundamentals of Project Management, Advanced Statistical Tools, Advanced Lean Methods, Process Modeling, Leadership and Coaching, and Financial Analysis. Download the Master Black Belt Body of Knowledge for full details. WHO: The program is designed for experienced Lean Six Sigma Black Belts who are prepared to advance their mastery of the technical and leadership subjects that comprise the Master Black Belt body of knowledge and practice. HOW: Training consists of two weeks of classroom instruction on The Ohio State campus integrated with two weeks (71 hours) of online learning from MoreSteam.com. The faculty is provided by OSU's Fisher College of Business and MoreSteam. Classroom weeks are scheduled on a quarterly basis, and you may start in any sequence. WHY: Because it's time for you to receive the next level of recognition. Once you have completed the coursework and developed enough experience, you are eligible for the certification process. Graduates receive a Master Black Belt Certificate from The Ohio State University. 71 hours of online learning through the MoreSteam.com portal. Training is then followed by testing, verification of experience, an oral interview and other certification requirements. When you have completed these requirements, you will be awarded certification through The Ohio State University. You can attend the classroom sessions in any order. They are scheduled on a quarterly basis at OSU (see below for the current training schedule). 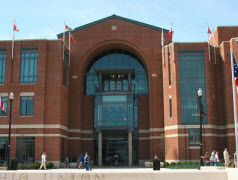 The faculty is provided by Ohio State's Fisher College of Business and MoreSteam. You can access and complete the online components at your own pace during the intervals between on-campus sessions. All you need is an Internet connection, course login and password to get started. Want to see what the online coursework looks like? Then take our brief course tour. Are you an experienced Lean Six Sigma Black Belt (at least five years of work) looking to advance your mastery of technical and leadership subjects? If yes, then you'll find our program both rigorous and rewarding. Because the program blends online and live training, you receive the flexibility and control you need to accommodate your already busy schedule demands. Once you have successfully completed the coursework, you can apply for certification, which is included as part of the program cost. Need justification for your Employer? Need a little help convincing the boss of the value of the program? Here's a handy template that you can use to position the details, benefits and costs of our program. The Master Black Belt program covers the skills you'll need to succeed: leadership, coaching, advanced statistics, finance, and more. It also includes advanced Lean and process modeling, two vital topics areas not covered by other Master Black Belt programs. With Blended Learning, the student controls the pace. You can start any online course at any time, and you attend the classroom weeks in any order. The program faculty, from OSU and MoreSteam (listed below), represents decades of professional Lean Six Sigma experience and affiliation with an internationally recognized university. The cost of Master Black Belt certification varies widely, as does the quality of the program. Our blended curriculum delivers deep content at an affordable price. There are no extra fees for certification or exams. Successful certification candidates receive certification as a Master Black Belt from The Ohio State University. After you complete the training portion of the program, you can begin the certification process. This process entails a review of evidence demonstrating your capability and experience as a Master Black Belt. One advantage of this program is that you can take the following live and online classes in any order. We limit participation in this program to Certified Black Belts with five years of process improvement experience, including three years as a Black Belt. This rigorous program assumes a mastery of the full Black Belt body of knowledge as a foundation. Does your Black Belt qualify? Many third party training providers and certification programs do not cover the full Black Belt body of knowledge, as we apply it. Please review the body of knowledge to identify and resolve any gaps prior to starting the program. You can find the Black Belt body of knowledge on the OSU Center for Operational Excellence Web site. The program cost is $12,000*, which includes the certification candidate evaluation process. Note that most other Master Black Belt training programs cost twice the price of this program and require four weeks or more of classroom time. Not only is this program more affordable, it allows you far greater flexibility and control over the pace and order of your studies. The enrollment fee covers all costs for courses and materials, although program participants must have access to a laptop loaded with the latest version of Minitab. You can begin your enrollment by contacting MoreSteam. * Rescheduling Fee: A rescheduling fee of $500 will apply for changes made within two weeks of the scheduled classroom training. * Refunds: No refunds will be granted within 90 days of your first scheduled classroom session. The faculty for this program is provided by Ohio State's Fisher College of Business and MoreSteam. Dr. SCOTT SINK, Ph.D., P.E. "How Much is Enough -- Managing Safety Stock for Hospital Supplies"
"Into the Trenches of Regression Analysis"
"The Power and the Pitfalls of Multiple Regression Analysis"
At the start of the program, you will be assigned an instructor (Master Black Belt) who will be your primary contact regarding questions and certification requirements. For general e-Learning technical support, you can visit our MoreSteam University support section, where you can search through our online knowledgebase. You can also send us a support request. In conjunction with leading process improvement deployments, MoreSteam and The Ohio State University Center of Operational Excellence have established a rigorous, advanced curriculum as the basis for this Master Black Belt development program. Does the order of training matter? Not at all. You can take the classroom weeks in whichever order you would like, and the online training is on-demand. You will need to have all of the training completed before you can begin the certification process. Is there a central portal for information? Yes. When you enroll in the program, you will be given access to a convenient class Web portal, along with course information, schedules, and other pertinent information. Need a little help convincing the boss of the value of the program? Here's a template to assist your persuasion.